One of the major reasons people get bored with a particular game is if they get to see the same thing every time they access a game. With time, they get tired of the look and start looking for a game with a different look. People are always attracted to new things, which is why new inventions always gain attention even if they have exactly the same level of usefulness with the old version. As long as it has a new look, people tend to patronize it because of the human tendency to get bored easily with the same things. This also applies to game as the look of the game is also very important to game players just as much as the game play. A good game with a good story line and interesting play could be a turn off for players if the graphics is not up to the standard of the game players. Furthermore, there is also the probability that you are not comfortable with few graphics of the games and just changing those part of the graphics would improve the attractiveness of the game to the player. Connected Textures mod help to achieve this aim in minecraft as it gives you the ability to change some of the graphics of the game to your preference. It is thus possible to use the Connected Textures mod to make your game graphics more beautiful than it originally was, thus improving on the game. For instance, it is possible that you are not comfortable with the glass or the grass on the minecraft game and would have wanted to change it. You can now easily use the Connected Textures mod to make the changes. Other items that you can change with the Connected Textures mod apart from the glass and grass include the stone and chest amongst other graphics in the game. You can therefore bring out the artistic part of you in the minecraft game by changing several of the graphics to suit your desires. You can thus change the colour of the grass or improve on the transparency of the glass so as to make it easier for you to see what is behind the glass. 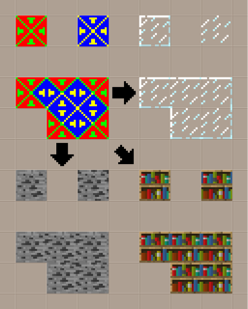 To install the Connected Textures mod, you would have to download it from the Internet and extract the program and drag it into the minecraft.jar by running the %appdata% application on your computer.